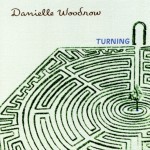 Singer/songwriter Danielle Woodrow packs more punch in a single verse than some manage in half a dozen. Her stripped-down ten-song set, all but two tracks are strictly vocal and solo guitar, is a “less-is-more” gem. Each song is melodically and rhythmically distinct, lyrically engaging and that much more compelling for their typically brief duration. While Woodrow most often navigates complicated, solitary emotional turf, as on “Can’t Keep Leaving You” and “Locked”, she also offers up a touching tableau of mature love on “Tommie & George”.